OURAY, Utah -- South of Highway 40 in eastern Utah, down a two-lane highway where the Green and Duchesne rivers meet, lies the small town of Ouray. Continuing south, the highway turns into a gravel road that rambles an additional 50 miles before it comes to a sign marking the oil sands lease owned by U.S. Oil Sands Inc. These days, however, the rural route is undergoing a major transformation. Construction crews are clearing brush and crushing gravel as they convert the sleepy Seep Ridge Road into a transportation artery about as wide as a four-lane highway. The road expansion will make it easier for U.S. Oil Sands to transport large industrial equipment to its lease site at P.R. Springs and to truck bitumen from the company's oil sands strip mine to refineries in Salt Lake City and Wyoming. Company officials say that if oil sands production in the region is successful, Utah may need to export bitumen by rail to other states. The sleepy Seep Ridge Road is being converted into a transportation artery as wide as a four-lane highway. Photo by Margaret Kriz Hobson. 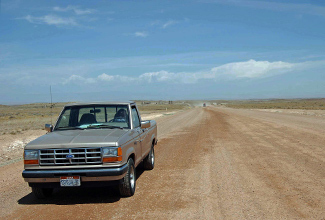 While the construction crews were spreading water on the roadway to prevent dust clouds from blocking their view, lawyers at the Utah Department of Environmental Quality offices in Salt Lake City were in their second day of hearings on U.S. Oil Sands' application to begin the nation's first commercial oil sands production (EnergyWire, May 17). Living Rivers, a Moab-based environmental group, is challenging a 2009 DEQ decision to allow the company to dump the residue of its oil sands extraction process into unlined pits at the site. The environmental group argues that the waste, which would include small amounts of solvent and residual bitumen petroleum, could mix with snowmelt and rain and contaminate surface and groundwater in the region. Living Rivers has asked a DEQ administrative law judge to require U.S. Oil Sands to conduct additional groundwater tests on the project before beginning its strip mining operations. State regulators insist that the proposed mine is in an area with little or no groundwater and therefore would cause minimal environmental damage. They want the judge to sign off on their permit allowing the firm to begin construction. Pending the outcome of the hearing, U.S. Oil Sands, which is based in Alberta, Canada, hopes to break ground on its new oil sands strip mine this summer and begin producing oil from the site by late 2013 (EnergyWire, April 26). Oil sands have been used for more than a century as a paving material. Canadian firms have been producing oil from massive sands fields in Alberta since the 1960s. But so far, commercial efforts to continuously extract oil from the sands have not succeeded in the United States. U.S. Oil Sands hopes to be the first company to successfully mine, refine and sell bitumen in America. While the legal debate continued in Salt Lake City, the early signs of energy development were clear 180 miles away in Utah's Book Cliff escarpment of East Tavaputs Plateau. Visitors driving along Seep Ridge Road can see evidence of the 180 core holes that U.S. Oil Sands drilled to study the makeup of the oil sands' veins at the P.R. Springs site. Oil sands are minerals that contain sand, clay and water saturated with a viscous form of petroleum known as bitumen. Bitumen can be refined into gasoline and other oil products. The company has also searched for underground aquifers to supply water for its operation. So far, only one deepwater well has been successful. Farther down the road, the company has extracted oil sands samples from a massive gravel pit. Those materials were sent to Canada to test the company's extraction technology. Next to the pit stand machines marked "Earth Energy" -- a reminder of the company's previous incarnation as Earth Energy Resources. U.S. Oil Sands lawyers and Utah regulators question whether water is present in the region. But during a long stretch of dry Utah weather, a small stream was running near an aspen grove downhill from the oil sands ridge on U.S. Bureau of Land Management property. The current signs of construction on the lease are just a hint of what's to come if oil sands production catches on in Utah. U.S. Oil Sands CEO Cameron Todd says the firm's initial operations would be limited to 200 acres. That includes 93 acres of open pit mines. If the early production is successful, the company plans more extensive operations on its 31,685 acres of leases in the region. Initially, the firm hopes to produce 2,000 barrels of bitumen each day. Eventually, the operation could produce 50,000 barrels per day. Todd says the oil sands veins are 30 feet below the surface, although the depth and thickness of the resource varies and some veins extend much deeper. Excavating those sands would involve stripping the land of vegetation, removing the topsoil and strip mining the resource. The company also plans to build an oil sands processing facility at the site to convert the minerals into bitumen. According to Todd, the company plans to extract the petrochemical in 30-acre plots. As the resource in the first site is exhausted, workers will fill in the pit with sand, rock and other material left over from processing the bitumen. U.S. Oil Sands promises to reclaim each pit by covering the debris piles with topsoil and seed. But environmentalists charge that the oil sands strip-mining operation would permanently despoil the high-elevation forest region and excavate the top of the P.R. Springs plateau. As a result, any water pollution streaming from the oil sands site would flow downhill into nearby surface streams. "This project will deforest, dewater or obliterate the near-surface water aquifers," said John Weisheit, conservation director at Living Rivers. "The meager soil they scrape off the surface that will later be used to revegetate the site will blow away during the windy spring season and then wash away during the cloudburst season of the summer and fall," he said. "Even if they could keep the soil in place, it will never support a forest ever again, because the commingled waste rock -- crushed rock, fines and sand -- will not retain precipitation." Opponents point to the environmental devastation caused by oil sands extraction in Alberta, where the massive excavation site and tailings ponds can be seen on satellite photos. Todd argued that the company's oil sands project in Utah would be dramatically smaller than the Canadian site. "If the tar sands mines in Canada are a supertanker, we're a rowboat," he said at a University of Utah unconventional-fuels conference last week. But Utah environmentalists weren't comforted by the industry promises. They accuse state regulators of rubber-stamping the oil sands project requests and worry that the Utah public has not yet awakened to the fact that the operations might cause serious environmental damage in the state. "Right now the company is flying under the radar," said Mark Purdy, a member of Utah Tar Sands Resistance, a local environmental group. The P.R. Springs oil sands site is in a high-elevation fir-aspen zone of eastern Utah, a forested region populated with Douglas fir, pinion, juniper and aspen trees. The region is a favorite of hunters because of the abundance of elk, mule deer and wild turkey. It's also home to the sage grouse, an imperiled bird species that environmentalists are seeking to protect. U.S. Oil Sands' lease is situated about 50 miles north of Arches National Park and 70 miles southwest of Dinosaur National Monument. But company officials note that their Utah lease is closer and more geologically similar to Grand Junction, Colo., where oil and gas development is prevalent. A U.S. Oil Sands Inc. development site in Utah. Photo by Margaret Kriz Hobson. Despite the industry's protests to the contrary, environmentalists say the oil sands operation would affect the two national parks because the company is proposing to run its mining operation in two 12-hour shifts each day, at night using lights that would be visible from the parks. To reach the minerals, the company would dynamite intermediate layers of limestone. The extraction and processing plants also would pump pollution into the air. "When they're out there blasting and their lights are on, you'll see that from Dinosaur National park," Weisheit said. "It's going to drive all the wildlife away." U.S. Oil Sands' Todd insists that the company plans to use the most environmentally friendly techniques available. He notes that the lands have been specifically identified for energy development. Along Seep Ridge Road, the landscape is peppered with natural gas pumping rigs. "It is not that these lands are conservation areas where development is prohibited," Todd told the House Science, Space and Technology Committee in early May. "Quite the contrary, other development such as conventional oil and gas exploration, forestry activities, cattle grazing and mining developments are allowed," he said. "It is only oil sand and oil shale leasing that is restricted." U.S. Oil Sands is leasing the land from the state School and Institutional Trust Lands Administration. But the U.S. Interior Department is also likely to offer lands in the region for oil sands and oil shale development. In February, BLM announced plans to significantly downsize the amount of lands that are likely to be leased for oil sands and oil shale development in the West. The new plan would cut by 75 percent the amount of land available for development in Colorado, Utah and Wyoming when compared with the George W. Bush administration's 2008 plan. But to the Utah environmentalists' dismay, the Obama administration proposal would continue to allow energy research and development in the P.R. Springs region, which the U.S. Geological Survey estimates contains 4.3 billion barrels of in-place bitumen. The agency has not estimated how much of the resource is technically recoverable. The promise of untapped oil resources has U.S. Oil Sands and other energy companies raising money in hopes of beginning energy extraction in the Book Cliffs region. 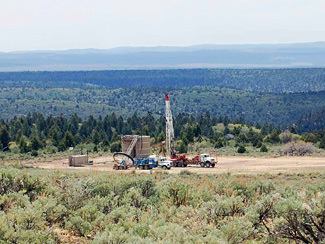 Red Leaf Resources Inc., a small energy company in Sandy, Utah, is leasing state lands in the region rich with oil shale. Enefit American Oil, the U.S. branch of an Estonian national energy company, is proposing to develop oil shale on private lands. The company owns state, federal and private leases in the area. So far, however, the other energy firms are waiting on the roadside while U.S. Oil Sands continues to blaze the trail.